Mu tong yao zi Xing Hua Cun"
April may be the cruellest month for Eliot, but for ethnic Chinese all over the world it is also the saddest month as its tomb sweeping time. April 5, 2003 was Tomb Sweeping Festival Day and marked the start of the month long period when filial sons and daughters flock to spruce up the graves of their ancestors, bring offerings and flowers, joss and incense. The centuries old tradition of sao mu or tomb sweeping is now perpetuated in Singapore mostly by visits to temple niches or secular columbariums where the cremated ashes of the dear departed are kept. In the Tang poem Tomb Sweeping Festival aka Apricot Village, Du Mu imortalizes the melancholy mood of Qingming Festival. Two Qingmings ago my dad was still alive. 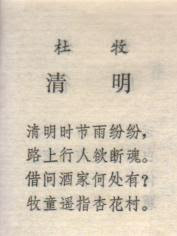 Like the typical Chinese-educated of his generation dad loved Chinese poetry, especially Tang poetry. My Chinese at best is weak but like my sister Lucy would say dad's genes must run strong in us as I share his love of Chinese poetry. By dint of sheer persistence, and with the help of audio tapes, pinyin dictionary, and english translations, I had mastered, if not 300 Tang poems, at least 30 odd ones ! 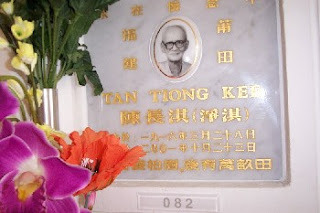 Dad passed away in October2001 and during the Qingming period of that year his health was failing rapidly. Affected by the season or perhaps he knew his time was drawing near he would, by way of greeting, recite Du Mu's sad little verse to me whenever I visited him in April of 2001. Ill health and old age kept dad in low spirits and he was often not quite himself. It was hard to find a breakthrough and the only communication I could elicit was through recitation of old poems that he had learnt and loved in childhood and adulthood. So we went through well loved verses like Song xia wen tong zi, Shao xiao li jia lao da hui, Xiang si, Huang he lou, Song you ren and many more. In retrospect, I don't know whether this improved dad's condition or mine, but at least there was this thread that could still distract us from present sorrow and pain. He was not always receptive though. Sometimes, retreating into his own world, he would grumble at me to "stop putting him through the test". Hou you wan mu tian! 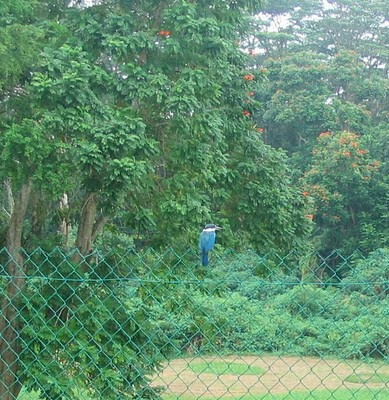 This has been used as his epitaph on the urn keeping his ashes at the Chua Chu Kang columbarium. Perhaps the best loved poem for dad was South and north of the mounds are scattered the many graveyards, another Qingming verse. We always recite this in Cantonese which is also my "mother's tongue" and which is also a very good dialect for reciting Chinese verses. Here is the verse written in dad's last handwriting and calligraphy, a little shaky and slightly indecipherable. He had also forgotten the strokes of a few words which I have phonetically "translated" from Cantonese into English. Unfortunately, I cannot locate the source, age or name of poet and even my aunty in China cannot throw any light. At that stage my dad was too far gone in ill health and memory loss to recall the details. And so, Qingming 2003 my family and I were at dad's niche in Chua Chu Kang columbarium, to sao mu to bring flowers and incense. 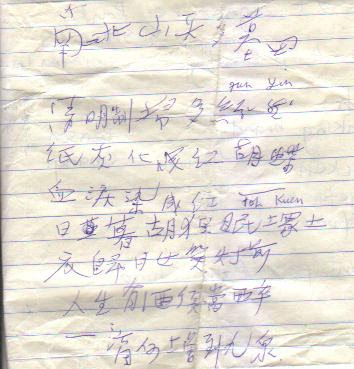 Postscript May 8th 2005 Thanks to my cousin Jian Hu from Fujian I have been able to trace the source of the poem "South and north of the mounds...." The correct title of this poem should be "Drinking wine on Qingming Day" * and the poet is Song Dynasty poet ¸ßôã (Gao Zhi ). 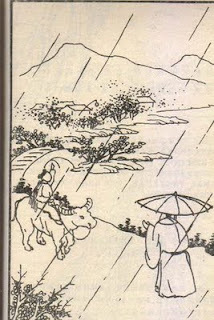 Furthermore thanks to my niece Chen Jie from Fujian, my piece Qingming dedicated to the memory of my late father has been translated into Chinese which is reproduced in the next post for Chinese readers on the net. To view the Chinese version please set your browser to receive simplified Chinese.